SIMCO Technologies, Inc. developed a numerical model called Software for Transport and Degradation in Unsaturated Materials (STADIUM®) that can be used to predict the transport of ions and liquids in reactive porous media. 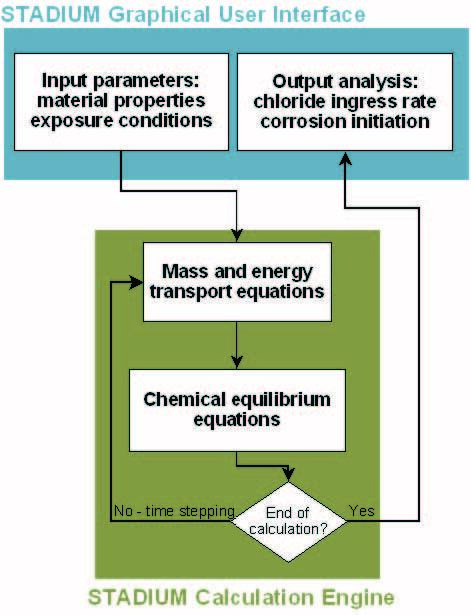 The model has been used to predict the degradation of unsaturated concrete structures exposed to chemically aggressive environments. The results provided by STADIUM® have been validated on the basis of laboratory test results and field exposure observations. 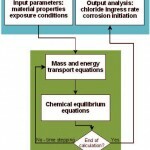 The model has been used to predict the behavior of numerous existing structures exposed to various forms of chemical degradation phenomena. The calculations in the STADIUM® model are divided into two primary modules. The first module accounts for coupled transport of ions and water without considering chemical reactions (e.g., dissolution, precipitation, etc.). Transport is modeled with a volume-averaged version of the extended Nernst-Planck equation, which accounts for the electrical coupling between the ions as well as for the chemical activity of the species in solution. Terms are added to consider the impact of fluid flow and temperature gradients on ionic fluxes. The transport equations are coupled to Poisson’s equation, which gives the electrical potential in the material as a function of the ionic profiles distribution. Coupling with moisture conservation and heat conduction equations is also taken into account. The second STADIUM® module is a chemical equilibrium code. After each transport step, this module equilibrates the concentrations at each node of the finite element mesh with the phases of the hydrated cement paste. Solid phases can also be formed as a result of the penetration of aggressive species into the porous network of the material. The variation of solid phases will lead to local variations in porosity. These variations will likely affect the transport properties of the material locally. STADIUM® takes this locally varying phenomenon into account in the transport module described above. Since 2010, STADIUM® is the only service-life prediction tool recognized and specified by the U.S. Department of Defense for the design and construction of new maritime works for the U.S. Navy, U.S. Air Force, U.S. Army Corps of Engineers and NASA.